Japanese luxury cars have come a long way since today’s Nice Price or Crack Pipe Maxima was built back in ‘86. This was once Nissan’s most opulent offering here, but now it’s just a nice old wagon with plush tufted seats. Let’s see what all that old school splendor is worth. I was shocked yesterday—SHOCKED I tell you—to learn that our candidate 1996 Cadillac Fleetwood rocked a six-speed stick. Can you think of a less likely place to find a stick shift sprouting next to your seat? At the movie theater, perhaps? Or in one of those police interrogation rooms? Maybe sitting on the can? Yep, it was as unexpected as the Spanish Inquisition. Unfortunately for the seller and the consignment shop offering it on his behalf, that didn’t seem to make its $17,995 price any more palatable. In the end, the car dropped in a hefty 82-percent Crack Pipe loss. That was admittedly, less than unexpected. You’ve know doubt heard of those as-yet undiscovered fossils that the paleontologists dub “missing links.” Those are the transitionary animals that evidence some sort of evolutionary shift from one significant form to another—say from beach-dwelling party reptile to sleek fish-like creature that calls the ocean its hang. 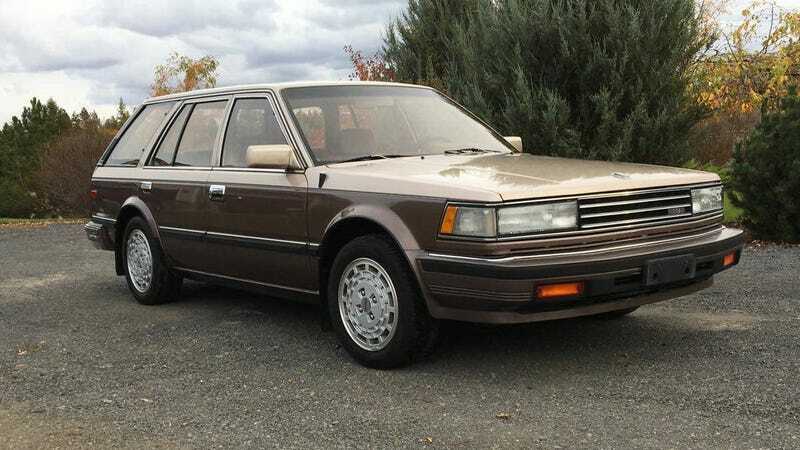 Today’s 1986 Nissan Maxima is the automotive equivalent to discovering one of those missing links. How’s that, you ask? Okay, a little history, and pay attention, there will be a quiz at the end. The Maxima is one of Nissan’s longest-running nameplates. Its birth actually closely coincided with that of the Nissan brand here in the U.S.. Maxima was initially the top model of the second generation 810 line, however for the 1982 model year the name took over completely from the numbers. The 810 was dead, long live the Maxima. The following model year the cars started carrying the Nissan name in addition to the soon to be phased out Datsun brand. That first Maxima’s layout was totally old school—a straight six in gas or diesel guise, and with everybody’s favorite, RWD. This second generation model was the first to offer the same basic layout as the current day Maxima. That means a transverse V6 engine and FWD. You know, just like almost every other mid-size car there is. What the second generation Maxima did carry over from its predecessor was its boxy styling, an aesthetic that’s especially attractive here in wagon form.That all makes it a little bit old, and a little bit new. See? The missing link, found! This particular one clooks to be in fine shape. You’ll no doubt notice its swanky two-tone paint. That’s another aspect that you just don’t see on present day Maximas, but it looks damn good here. The factory alloy wheels have an Italianate appearance—always a good thing—and the car rocks what is possibly the greatest feature ever designed—keypad door locks on the driver’s door. Ford and Nissan were, I think, the only companies to offer this amazing convenience feature, and Nissan doesn’t even do so any more. This one has it, and in my not so humble opinion, that makes it worth the price of entry alone. Once you do get inside the car you’ll find it filled with tufted velour. It’s seemingly everywhere standing in as a luxury accoutrement where leather would suffice today. The only issues in here are a split on the driver’s armrest, a tumescent steering wheel cover, and some irregular fading of the materials throughout. On the plus side, the car rocks power seats, windows and locks, a roof through which you may moon, and perhaps best of all, a graphic equalizer for the component-styled stereo. Under the hood lies a 157-horsepower VG30E V6. That engine’s single overhead cams are belt driven and in the Maxima the pistons will introduce themselves to the valves should the belt fail. Oddly enough, the version of this mill used in the Nissan Quest/Mercury Villager is a non-interference job. Here that demands that the seller note how recently the belts have been changed before transferring ownership. That’s something he neglects to do in the ad. He does say that he is only the second owner, and that the 167,000-mile car has spent most of its non-mile making time in the garage. The ad says that “[e]verything works amazing” with the exception of the R12 A/C which apparently needs more cold pumped in. The transmission here is a four-speed automatic, a fact that I was leaving to near the end as I know that for many of you just the mere sight of a slusher makes you want to punch a puppy. Perhaps making little dogs safe again, the car comes with new Dunlops, a clean title, and a price tag that’s a seemingly wallet-friendly $3,700. Okay, it’s now time for you to vote on that price for this “missing link” Maxima. See? I told you there would be a quiz at the end. What do you think, is $3,700 a fair price to experience some old school Japanese luxury? Or, is that price for this car simply way over the Max? Tri-Cities, WA Craigslist, or go here if the ad disappears. H/T to Jordan Green for the hookup!